Strolling around Port Vell, along Las Ramblas and around the Gothic Quarter | Barcelona Mini-break, 2005 Day two - This time, not here for a stag do! I'm not a morning person. Anything before 7:30 and I need a couple of coffees to get me functioning, so to get on a 7:55 flight to Barcelona was going to be difficult. When you start to work the time backwards - 2 hours before check in, travel time to the airport parking, transfer from the parking to the terminal etc etc - you end up with a waking up time that most people would class as ungodly. That time ended up being 2:30am for a swift 3am departure. The day before had been spent worrying about whether the force 10 cough I had developed, one that would put a seal's bark to shame (and that was, incidentally, ripping my chest to pieces with every cough), would disappear before our little trip away. When I eventually headed for bed at 10pm, that gave me potential sleeping time of 4 and a half hours, but thanks to some noisy people in the street at 1am and my annoyingly regular coughing, I then spent the next hour and a half watching the minutes ticking away and wondering just how I was going to be fit to drive to Gatwick airport. Four Pro Plus (2 at 1 hour intervals) and two cans of Red Bull. That's the answer! The flight with EasyJet was pretty much running like clockwork and visibility was good on the journey over - we were treated to stunning views of the Pyrenees alps which act as a natural boundary between southern France and Spain. Soon after we spotted signs of civilisation and as we flew in towards Barcelona I was able to pick out all the features below us from the small map of Barcelona I was holding. The weather was looking great and the city was spread out below us just waiting to be explored. We caught the Aerobus from the airport to Plaça Catalunya (Catalonia Plaza), or rather that was what we had hoped to do. What actually happened is that we passed Plaça d'Espanya at which point I checked my map which had that location circled and I got a little lost. I thought we'd gone past our destination ("They've changed the name from Catalunya to Espanya!" I concluded), so we hopped off at the next bus stop. More detailed checks showed that we hadn't arrived - they were very much different locations! - and so we worked out a route that would take us to our hotel without too much bother. The hotel we had opted for was called Auto Hogar ("It is a two star," said the girl in the tourist information bureau at the airport. "They are not marked on the map," she continued, circling our hotel's location for us). We had thought it was a 3 star hotel, but given that the mini break had only been booked over the phone 4 days previously, we hadn't had much of a chance to check facts properly. Ah well, it might not be so bad, we thought. 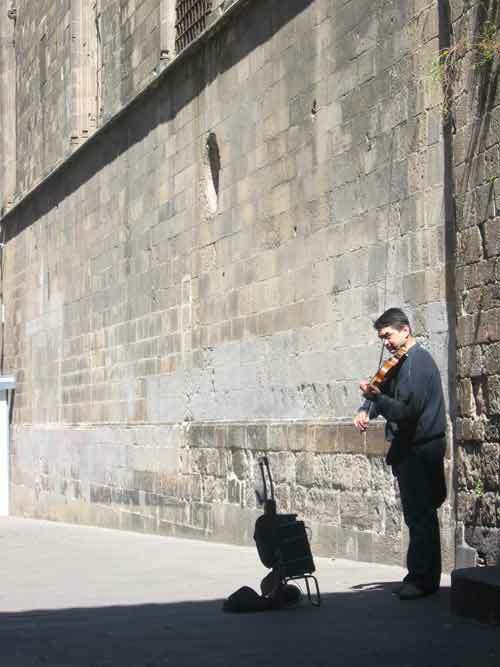 Traveling around the world on a budget changes your perspective on accommodation, it has to be said. Before, a good room was one that had air conditioning, windows that closed properly (to keep the mosquitoes out) and a shower that could at least reach a temperature close to 'tepid'; clean/tasteful bed sheets were a bonus. Auto Hogar may have been a 2 star hotel, but to us it felt more like a 5. Well, maybe a 4. Bottom line - it was a clean hotel, with good facilities and was really well positioned (a Metro station just outside, a 5 minute walk to the Port Vell and Las Ramblas areas - more about these soon). By midday we had checked in, showered and got ourselves to a local eatery - literally on the doorstep - for a spot of lunch. The early start may have been a little on the awkward side, but it gave us a good chunk of the day for exploring and orientation. At this point I should add that this was not my first visit to Barcelona: I had been in the city 2 years previously (same month) and had managed to do a little sight seeing, but given that the reason for my previous visit was for a stag do, you'll understand why visiting sites of cultural interest was not necessarily all that easy to fit in! I could, however, at least claim to know what there was to see in Port Vell, Las Ramblas and the areas around the gothic cathedral. So that's what we did in the afternoon. 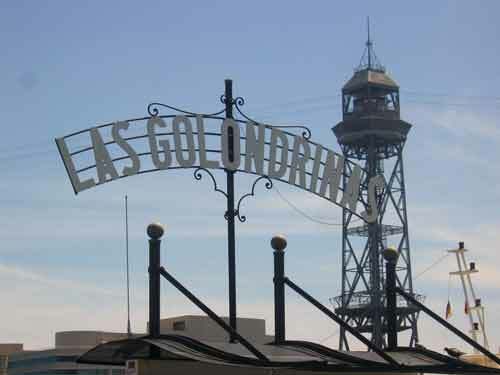 Las Golondrinas - Sign at Port Vell. 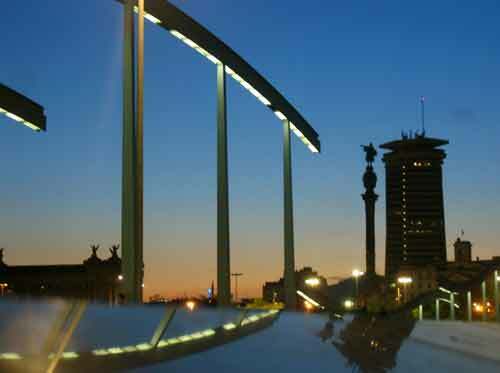 Port Vell is the site of the marina and is overlooked by the statue of Columbus (Monument de Colom). Like many marinas that has undergone redevelopment, it looks quite swish (the boardwalk is a nice place to take a wander on a warm day) but there's not actually a huge amount to do here. At night the place livens up a little when the restaurants directly overlooking the marina start to fill with British tourists there for stag dos and hen nights - usually this is an hour when the punters are no longer concerned about the inflated prices - but during the day there's little to occupy the brain; there is a small shopping mall there but nothing that seems to cater for the tourist and yet simultaneously it doesn't appear to be there for the locals. I don't know who the shops are for! So, we did a brief circuit and then made our way back to dry land to continue our strolling up Las Ramblas. 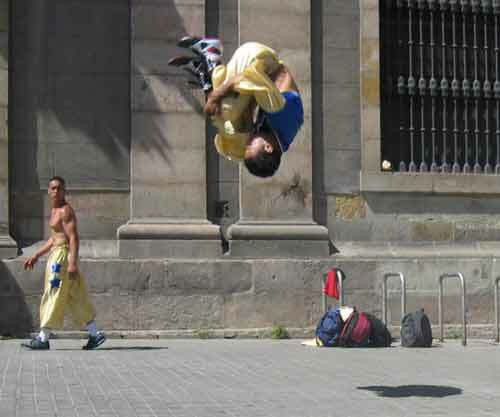 A street performer in Las Ramblas, mid-somersault. 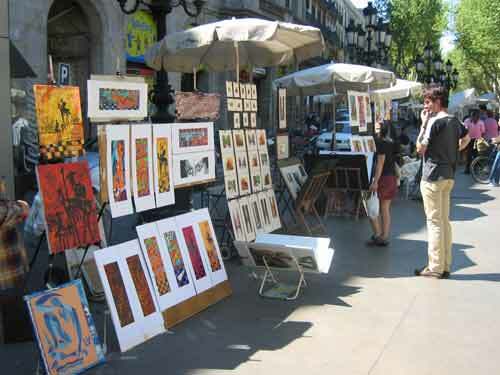 I had always assumed that the name of Las Ramblas had something to do with walking (you know, rambling) on the basis that the street is pedestrianised. It turns out that the name comes from canals that ran along the same route from Plaça Catalunya down to the waterfront. According to the guide books, the street is divided up into distinctly different sections that are known for specific things. I was able to tell when we were walking through the flower-selling section and also the area that is populated by artists selling their wares (and offering the chance to have caricatures knocked up on the spot) but aside from these parts, the sections were not distinct. No matter, its sill an enjoyable way to spend time just wandering up and down the old streets and taking it all in. 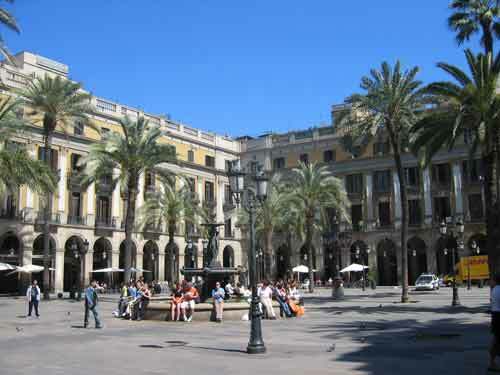 We didn't continue all the way up as far as Plaça Catalunya, instead opting to take a right turn into Plaça Reial, a charming little square that was bathed in sunlight and full of people enjoying the the good weather. It was, for us, little more than a doorway into the old gothic part of own. 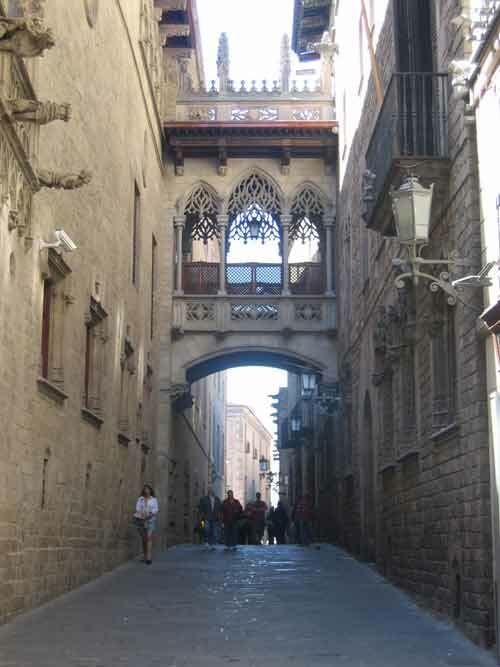 We headed in the direction of the gothic cathedral and in doing so found ourselves walking through some beautiful streets - notably, Carrer del Bisbe with its archway that is very reminiscent of the Bridge of Sighs in venice. Walking through this area, Manda and I both commented how it was like being back in Florence. When we eventually made it around to the cathedral, we discovered that it was having a bit of a facelift. By that I mean that the entire front face of the cathedral was hidden behind scaffolding, so we popped in to one of the souvenir shops directly opposite to look at the postcards, to see what we should have seen. Soon after this, we backtracked to Las Ramblas and then on to our hotel for a break before heading again for the evening. The early start and the sunny weather had worn us out earlier than normal. I could easily have gone to sleep at 5pm and slept through until the next day, but I disciplined myself and had a 1-hour power nap. Batteries recharged somewhat, we both felt ready to take on Barca again. Well, when I say 'take on barca' what we actually did was retrace our steps from earlier and have dinner in one of the places outside our hotel, head back to Port Vell for a beer overlooking the marina and then back to the hotel. Not exactly the most adventurous itinerary, but I was happy with still being awake after the long day!